Weather - Summer: March to May, Monsoon: June to August, Autumn: September to October, Winter: November to February. Climate of Nagaland depends upon the altitude of hill ranges and varies from tropical to sub-alpine. By Rail- The major railhead in the state is Dimapur, which is linked to Guwahati, the gateway to the northeastern India. By Road- A good road network covers the state. The state capital Kohima is linked to Shillong and Guwahati, which are important cities in north-eastern India. 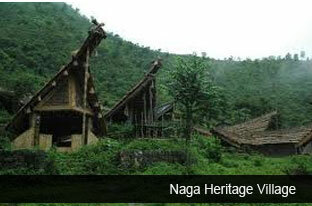 The vibrant land of the Nagas, the ethnic tribal groups, Nagaland is a paradise of the north-east India. The early history of the Nagas reveals the tribal essence of the region. The ethnic tribes previously were referred to as Naka, which in Burmese language means people with pierced nose. These Nagas were the brave warriors who considered the safety and security of their guests as an honour. The same ethos is still present in the hospitable Nagas who take prestige in treating their guests par excellence. Topographically, the state is located in extreme end of north east India and is bound by Myanmar in the East; Assam in the West; Arunachal Pradesh and a part of Assam in the North with Manipur in the south. Its mountainous geography is basically based upon the Naga Hills. Mt. Saramati at an altitude of 3,826 m is the state's highest peak. Doyang, Diphu, Barak and Chindwin rivers flow through the state. Covered with wooded forests, the state is rich in evergreen tropical and sub-tropical forests featuring bamboo, palms, timber and mahogany trees. These forests form a perfect backdrop for the Nagaland flora and fauna to flourish. Here, porcupines, elephants, bears, leopards, bears, monkeys, sambar, oxen, etc thrive through the state’s forests. The Great Indian Hornbill, the face of Nagaland is also found here in abundance. 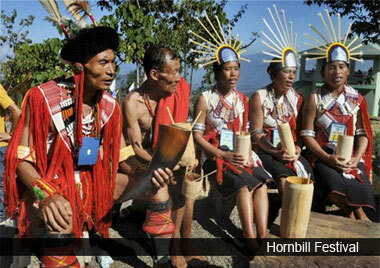 In fact, on the name of Hornbill, the famous annual Hornbill festival is organized here with full gusto. Culturally, the state is vivid and unique. The presence of sixteen different tribes; each having distinctive traditions, customs, rituals, language and even dresses contribute to the rich cultural character of Nagaland. 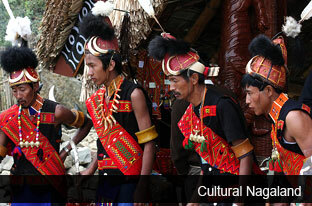 The Konyaks, Aos, Angamis, Lothas and Sumis are the biggest Naga tribes amongst all. The Nagas, being loyal to their clan and traditions are the main upholders of their preserved legacy here. This is evident from the fact that every tribe has a different shawl pattern, which acts as a differentiator in the state. It denotes the social status of the wearer. Even this facet is visible in the form of different festivals. Each tribe here celebrates its own festival, making this state a vibrant kaleidoscope. Hotels – The state of Nagaland is also known for its hospitable element. The Nagas always are gracious and elegant hosts. To experience the hospitable Nagaland at its best, foreign tourists need to register at the local Foreigners Registration Officer (FRO) of the district; they visit within 24 hours of arrival. However, domestic tourists still need to obtain an Inner Line permit issued by the authorities.